Is anxiety or fear keeping you from doing the things you want to do? Do you feel drained of energy or that all pleasure has gone out of life? Are you tired of carrying around emotional pain? Are you and your spouse driving each other crazy? Has your child experienced a trauma or negative situation that worries you? Do you face negative discrimination on a daily or monthly basis? Life is full of unpleasant and sometimes traumatic experiences. My goal, as a psychotherapist in Ann Arbor, Michigan, is to help my clients move past these unpleasant experiences to find happiness and fulfillment in life. With years of experience in the field, I have helped people who suffered from depression, anxiety, post-traumatic stress, and general pain. As a psychotherapist who enjoys working with a variety of people and their problems, I connect best with those who are interested in making core changes in their lives. I work with children using EMDR to overcome traumatic experiences, including bullying and abuse. Much of my work is based in EMDR therapy (Eye Movement, Desensitization and Reprocessing) and bioenergetics therapy; both techniques allow me to connect with clients, integrating their minds, bodies and heart. 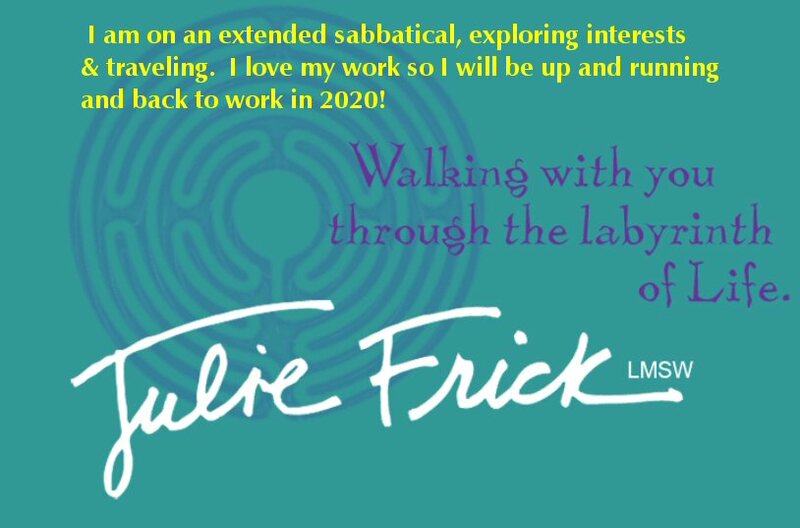 I am Julie Frick, LMSW, and I am ready to help you achieve balance in life. Contact me today to set up an appointment to begin your journey back to happiness and wellbeing.